Gabions do not support life they kill life? Whilst the idea that a wall can be built using gabions - boxes made of heavy duty galvanised steel wire net filled with stones is attractive. 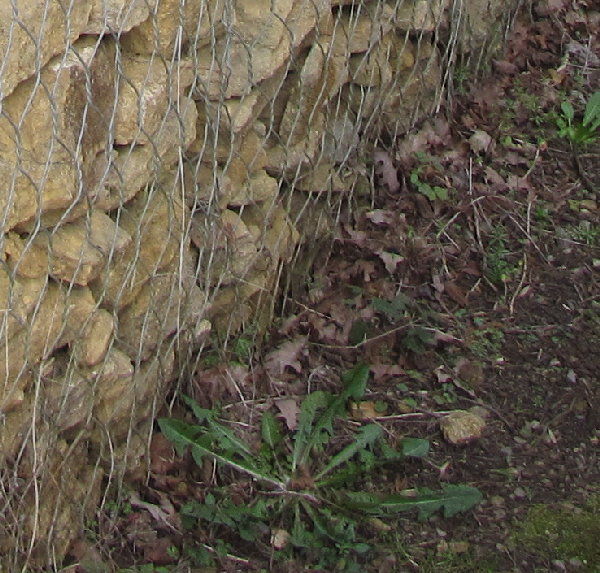 Attactive, because gabions provide a means to build a retaining wall for a hillside for an attractive cost. The reality is more disturbing. these "boxes" do not support growth. 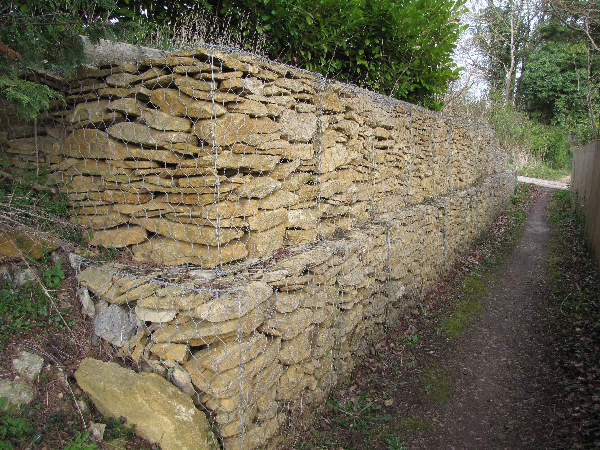 The installation of gabions on 16 Staples Hill adjoining the bridleway has created an eyesore for those who use the bridleway. I suppose the owner thought that they would gradually blend in to the landscape but they have remained devoid of life since they were installed. Was this last year or the year before? No it is over six years since the gabions were filled with stone! How on Earth could those gabions be dead. Surely during a period of six years plants would have established themselves? But no, no life - see my photographs below. I will forward my observations to the appropriate govenment agency and other organisations. But in the meantime, given clean stone, not sterile stone, why would there be no growth on what amounts to a pile of rubble? Does it result from the lack of organic material, deliberately rejected from incorporation in the gabion boxes as it might corrude the steel? Or is there some sort of Faraday cage effect on life? Given a galvanised wire fence on its own it would be covered in climbing plants over a period of six years. This wall is shaded by a wooden fence but then so are other areas of the bridleway and they are covered in growth. The facts are in six years since they were installed there is no growth. I await an acceptable explanation. The photo below is a full size crop taken from the previous photo. I have seen no evidence of weed killing being carried out. Sustainable travel: Car vs train? One wonders, or rather I do, that we are being mislead over whether its better to use our cars or use the train. I am only going to focus on the cost and convenience of using either. Convenience includes use of our time. I considered titling this article: Car drivers are mugs. Using a car is considered the most convenient means to travel, whenever one wants, between two places A and B. All one does is get in your car close to home or even on ones property and drive to anywhere. Car travel costs include: fuel, maintenance, and Motor Vehicle Road Tax (license) or Car Tax for short. Road Tax is not even used to maintain or build new roads. The risk to other road users, oneself and passengers are covered by a compulsory insurance. There is NO subsidy from the taxpayer. That's why car drivers could be considered to be mugs, car drivers do not get any subsidy from the taxpayer. All other public transport receives tax payers support, that is because public transport needs subsidy, otherwise the fares would be far too expensive. That means that public transport is unsustainable to me! Train fares are not only expensive, more expensive than the fuel used to drive a car, even a car with no passengers, but can hardly be sustainable since half the costs have to be met by the taxpayer. So train travel costs twice the cost of the ticket per mile! As for convenience, it is not easy to take luggage, a fold up bike is a worry as few train operators accept more than a few. One has to get to the train station and get from the nearest station to where one wants to travel to. One can hardly use a bike to get to the station and use a bike to get from a destination station to one's place of work. So the cost of getting to the train station might include car parking charges and bus fares or leaving a bike which could be stolen or vandalised at the station. Even in London one might be better off walking the whole journey. Even in the 1950's I used to roller skate to school! And bike to work in the 1960's. I can't see how train travel is sustainable transport when it costs so much! One could argue that using a car means that in addition to the cost of fuel there are running costs and depreciation of the value of the car that have been ignored but, the train traveller is most unlikely to not own a car. A parked car still costs a daily amount to cover insurance, tax, maintenance and depreciation. We could either add this to the real cost of using a train to travel or give up the car. I cannot see people giving up their cars. What workers should do is include in their travel to work and travel costs in general costs of ownership of their own car. Planning ahead train users can get cheaper tickets I suppose this increases the subsidy that train users get. Car drivers are mugs because they put up with being charged more and more for fuel, not from the suppliers but from the government and admonished for using their cars. We should really compliment car drivers for saving taxpayers money! However, rich people could find the train more convenient as they could use a taxi to get to and from the stations. It is possible to actually sit down whilst travelling by train but that is not a common experience! Although it was in the 1980's. The present reality is that train travellers have to stand often for journeys of even over a hundred miles! I suppose that first class travellers have a guaranteed seat. One could also read the daily papers whereas if one is driving one can only listen to the radio or talk to one's passengers. However, travelling by train one still has to spend time getting to the railway station and from the railway station to one's destination. Travel time? Yes there is no doubt that travelling by train can be considerably faster than using a car. This time could be at the expense of the environmental damage though. The faster a train goes the greater the drag. A train travelling at 140 mph has four times the drag of a train travelling at 70 mph and this increases the cost per mile. The government is suggesting that people could commute further to work by introducing high speed trains. What is being encouraged is further waste of precious fuel and the building of more houses in the countryside. What can we do? What can we do to reduce travel costs? Do we need to commute to work? Yes if there is no suitable employment in our area. Did we realise that by moving into suburbia or the countryside that we have to rely on motorised transport? Should houses be built where the only work involves commuting? I think that housing should not be built where the occupants will have to rely on public transport or their own vehicles to get to work. The trouble is that building on green field sites is cheaper. There is no easy way to move with one's job and should one have to? We could use a bicycle. The advantages are that travelling by bike is a lot faster than walking and is incredibly cheap. At least one disadvantage is it is a lot more dangerous than travelling by car. How much nuclear fuel have we got left? We know, but put to the back of our minds, that fossil fuel is being used up and wonder what will we use in future. Our concern is over our grandchildren and their children rather than our own futures. The article together with the comments makes very interesting reading. Is the answer Thorium? CPRE wants politicians to recognise that planning is the best and most democratic system we have to protect and enhance the countryside, promote urban renewal and improve people’s quality of life. It wants to see the next Government backing higher development targets for brownfield land and investing heavily in low carbon travel, including in often-neglected rural areas. and support new areas of Green Belt. It is also calling for a strong campaign to change people’s behaviour on litter and fly-tipping, as well as the introduction of a national deposit scheme for drinks containers. You can lobby your local parliamentary candidates by sending them an email via CPRE’s website: www.cpre.org.uk [the direct link is: http://e-activist.com/ea-campaign/clientcampaign.do?ea.client.id=21&ea.campaign.id=5351]. Fossil Fuel and Mineral Exhaustion - No Future for Human Life? Since the Industrial revolution and earlier civilisation has been plundering the World's resources. All our machines use fuel that is derived from fossil remains, and it is now getting harder and harder to find new deposits. I know that we are not going to run out yet, but we will. I am starting to feel a bit happier after watching this video. I'll be happier still if the planned third runway at Heathrow is scrapped.